Best Outdoor Tanning Lotion of 2019: Do NOT Buy Before Reading This! We associate good looks and good health with a bronzed and glowing skin, which is why salons with sun beds have popped up all over the place. Catching some natural sunlight while enjoying the benefits of fresh air and even a game of volleyball or golf is by far the better way to bronze up. To protect your skin from damage, make sure to use the best outdoor tanning lotion chosen to suit your skin type. In this way, you can quickly achieve a dark and healthy-looking tan that remains moisturized, soft and supple. Outdoor tanning lotions are designed to protect your skin while enhancing your tan and making it last for longer. They are affordable, and many of them also contain bronzers. What Are the Benefits of Tanning Outdoors? How Do Indoor Tanning Lotions Differ From Outdoor Tanning Lotions? What Outdoor Tanning Lotion Works the Best? When humans are exposed to ultraviolet light, which are electromagnetic rays produced by the sun, the skin produces additional melanin. The melanin also moves closer to the surface of the skin. Melanin is the substance that gives the skin its color. The more you have, the darker your skin. The skin goes darker to protect itself from the sun’s ultraviolet radiation. Darker skin absorbs ultraviolet rays preventing them from reaching the inner layers of skin and causing more damage (1). The sun emits many rays, but it is the ultraviolet rays that cause the most damage to human skin. UVB is the main culprit causing sunburn and ultimately cancer. There are around 500 times more UVA rays than UVB rays. In fact, 95% of the ultraviolet light that reaches earth is in the form of UVA rays. They too cause cancer. They penetrate deeper skin levels into the basal layer and cause the skin to age prematurely. To protect your skin from sun damage, you should choose a sunscreen with a broad- spectrum SPF that protects against both forms of damage (2). The sun protection factor or SPF is a measure of how well a sunscreen will protect your skin from UVB rays. Although UVA is equally damaging the SPF does not offer a measure of protection against these rays. The SPF explains the length of time that the sunscreen will protect you. An SPF 15 for example with allow you to spend up to 15 times longer in the sun without burning. 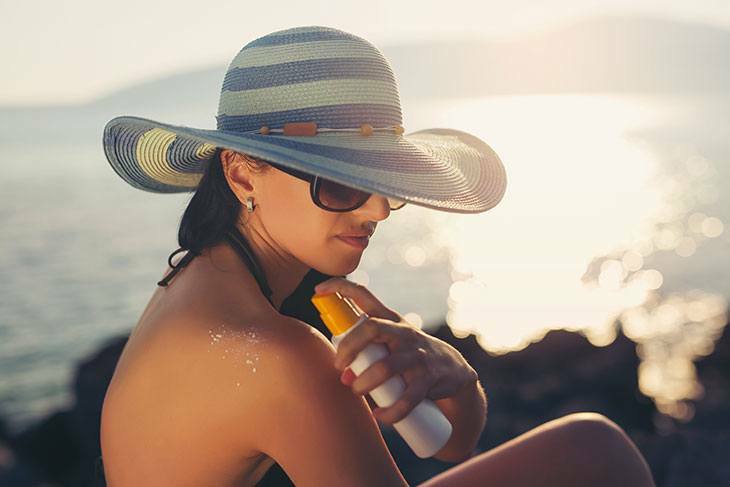 Although the SPF does not offer a measure of UVA protection, many outdoor tanning lotions offer broad-spectrum protection meaning that they do protect against UVA (3). There is no doubt that the sun causes damage to the skin that can result in premature aging or skin cancer. There are however many benefits to enjoying the sunlight, and we cannot live a healthy or happy life without some sun exposure (4). We need sunlight to produce vitamin D. Many people are vitamin D deficient as they fear the suns rays and make frequent use of sun blockers. Many people prefer the bronzed look that sunlight gives them, giving them self-confidence and a positive body image. Sunlight tends to give us a positive outlook on life. People who lack sunlight often suffer from depression. Sunlight can help to dry up acne. Once you have a tan, your skin is better able to protect itself from future burning. Tanning lotions are intended to protect and moisturize the skin while promoting a darkened tan. Most contain tea tree oil, copper, green tea, melanin, and L-tyrosine. Some outdoor tanning lotions come with a bronzer which will further boost your golden tan. The SPF will protect your skin from sun damage. Read the instructions and use only as intended overuse could result in skin irritation and underuse in sunburn. Before using any new product, you should do a twenty-four-hour patch test to ensure that you do not have an allergic reaction to the product. Although some tanning lotions are designed to be used both indoor and outdoors. Salon tanning is very different from outdoor tanning. In the salon, you are subjected only to UVA rays in a controlled environment. Indoor tanning lotions have been developed to enhance the effect of UVA rays while the SPF in outdoor creams is designed to limit the number of UV rays that are absorbed into the skin. Quick acting tan – outdoor tanning lotions are designed to promote a rapid tan so that you can get dark fast. Lasting results – because the skin is kept hydrated the tan will last for much longer and won’t peel. Moisturizing skin – suntan lotions contain moisturizers that will keep your skin hydrated, replenishing lost moisture while you tan. Odor prevention – naturally occurring bacteria tend to thrive in warm sunlight, and they can make the skin quite smelly. Most tanning lotions contain an anti-bacterial to prevent rampant bacterial growth. They are also gently fragranced. Australian Gold is the most recognized brand in the suntanning world and has been around for more than twenty-five years. This product with SPF of 15 will protect your skin from both UVA and UVB. Its oil-free formula will not make you sticky or greasy. It contains Australian Acacia Extracts what will keep your skin soft and moisturized. And, it is fragranced with the soft Australian Gold scent with which so many are familiar. Panama Jack is a non-greasy suntan lotion formulation with an SPF of 8. It contains antioxidants and vitamin E to nourish the skin. It is water resistant, and you would need to reapply it every eighty minutes to ensure that you remain protected. The product will ensure that you achieve a smooth bronzed look that lasts. This tanning lotion is hypoallergenic, so it is an excellent choice for sensitive skins. It has a very light fragrance. The product is light and feels a lot like a moisturizer when applied. Hawaiian Tropic has a classic coconut fragrance and features antioxidants that will nourish your skin preventing it from drying out and keeping it soft and hydrated. This product has a sun protection factor of 4. Re-apply the product every eighty minutes when you have been in the water. This product contains no bronzer. It has been tested and lasts over three years and so does not quickly expire. The SPF is pretty low, so you must consider the length of time that you will be exposed to the sun. Use this once you have a base tan, that makes your skin better able to cope with the suns rays. This product is not oily and will leave your skin feeling soft and smooth, not sticky or greasy. Bain de Soleil is an oil-based suntan lotion that contains an SPF 4 to lightly protect your skin from the sun. The product has been preserving skins for more than thirty years. Despite the oil base, the product has a non-greasy formula which will not leave you shiny with oil but will leave your skin well moisturized and hydrated. It is in gel form and goes on smoothly. It will help you to quickly achieve an all-over bronzed look and ensure that the tan lasts. And, it has a lovely tropical fragrance and will lightly bronze your skin even before you have tanned. Although this product will protect against both UVA and UVB, it may not protect light and sensitive skin sufficiently. It is perfect for those that have a base tan and want to get dark fast. This suntan lotion ticks all the boxes. It is an indoor tanning lotion that is also good for outdoor use. It does not wash off in the shower. The cream contains Agave, Argan and Coconut Oil. This dark tan accelerator will ensure that you quickly achieve that all over bronzed look. It is made from a soft and silky silicone with bronzer, that won’t make you orange. The Artemis Apollo contains a rich moisturizer to keep your skin smooth and hydrated. It also includes protectant for tattoos so your tattoos won't fade in the sun. What's more, this suntan lotion is scientifically formulated to last so you'll stay brown for longer. Artemis Apollo is not just good for indoor tanning under the lights, it is also suitable for outdoor use. Now you can leave the salon and step into the sunshine knowing that your skin is protected. It has a pleasant unisex fragrance. The product is covered by a money back guarantee so if you are not completely happy you can return it for a refund. It is paraben free and has not been tested on animals. Our choice of best outdoor tanning lotion is Australian Gold. This is a brand that has been protecting skin from the sun’s harmful rays for decades and is a firm favorite and trusted brand. The scent, unchanged for decades, brings back nostalgic memories of seaside holidays. The lotion with bronzer and with SPF 15 is a winner when it comes outdoor tanning lotions. Why pay for that tan that the sun bestows for free? Get out the best outdoor tanning lotion that matches your skin type and hit the beach.